U.S. specialists are currently awaiting the White House’s next drug certification report, which is normally released in September, to see whether the Bush Administration will continue to use the document as a political tool rather than a piece of objective research. In the summer of 2005, Venezuelan officials suspended collaboration with the U.S. Drug Enforcement Agency (DEA) over Caracas’ allegations that the U.S. agency had engaged in spying. In response, Washington decertified Venezuela as a cooperative anti-narcotics partner, and labeled it as one of two countries worldwide which “failed demonstrably to make substantial efforts” in the anti-drug campaign. However, the decision to blacklist Venezuela in the “war on drugs” was an unalloyed hoax. The Bush Administration’s accusation that Venezuela had failed to implement anti-drug measures drawn up by U.S. policymakers did Caracas an injustice. It was a judgment inspired more by political differences rather than a genuine critique based on legitimate drug-trafficking issues. In fact, the administration’s finding was little more than Washington sensing an opening to take another jab at Chávez’s Venezuela for its insolent attitude. This is not surprising considering that the decertification process is so self-serving and political that it is held in low esteem worldwide because of its lack of transparency and its indifference to evidence which challenges the White House’s simplistic verdict against the leftist regime. Washington’s decision to decertify Venezuela was a calumnious attempt to use ostensibly non-political means to achieve its ideological ends. Since the drug certification process is ultimately a presidential endeavor, there is every reason to believe that the legitimate facts of the matter that were in Venezuela’s favor were excluded from the decision, considering that President Bush has pegged his Venezuelan counterpart as, aside from Castro, his number one hemispheric foe. According to acting Assistant Secretary of State for International Narcotics and Law Enforcement Affairs, Ambassador Nancy Powell, “the [U.S.] President determined that the Government of Venezuela had not addressed the increasing use of Venezuelan territory to transport drugs to the United States.” But her claim merely transposed the responsibility for making the accusation to the U.S. president, and did not definitively authenticate Venezuela’s role in the drug trade. Indeed, there is ample evidence that Venezuelan President Chávez has been as vigilant over this issue as any of the “partner” nations supposedly cooperating with Washington. The allegations against Caracas are all the more slanderous when laid next to other official U.S. compilations of data. 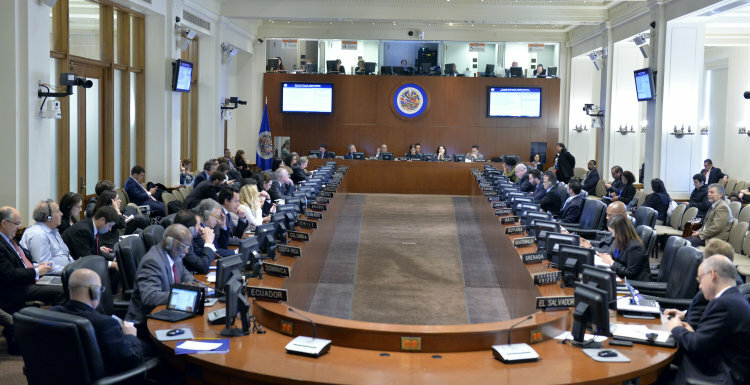 Statistics provided by the U.S. International Narcotics Control Strategy Reports (INCSR) in 2005 gave positive marks for Venezuela’s anti-narcotics efforts. These accolades are even more impressive considering that Venezuela’s neighbor, Colombia, represents the world’s largest cocaine producer in the world. Such difficulties notwithstanding, the Chávez administration actively takes steps to interdict drug supplies, to destroy drug production sites, and to formulate agreements with other regional countries to combat drug trafficking. Even if stringent border controls or more transparent security were in place, geography has damned Venezuela to an inevitable role as one of the transshipment points since its border with Colombia is almost impossible to control. As Jesse Chacón, Venezuela’s Minister of Interior and Justice, stated “We are neither major producers nor major consumers, but our geographic position makes us a country of transit.” In early 2006, a drug bust in Mexico served to confirm Venezuela’s unfortunate reality about its relatively peripheral role in the international drug trade. On April 5, 2006 a DC-9 twin engine jet originating from Caracas landed in Ciudad del Carmen, Mexico, carrying 5.5 tons of cocaine with a worth of about $100 million in street value. Operating on tips from U.S. and Venezuelan authorities, the Mexican army was awaiting the plane’s arrival in order to conduct an inspection. Although a few airport officials tried to block the search of the plane with fraudulent allegations of a potentially explosive oil leak on the plane, authorities were able to seize the aircraft’s illicit cargo. Although the pilot of the plane managed to escape, officials took into custody the co-pilot and some suspect airport personnel. Over the past few years, Venezuelan authorities have been increasingly successful in intercepting drug shipments. The 2005 INSCR report supports these findings, with statistics from 1998 to 2004 indicating that over that period seizures rose from 8.6 tons to 19.07 tons. According to Venezuelan government sources, 58.5 tons of cocaine, 18.3 tons of marijuana, 869 pounds of heroine and 766.7 pounds of crack were intercepted in 2005, which representing an 87% increase from the previous year – hardly the mark of a lackadaisical or uncooperative anti-narcotics effort. In 2004, the Venezuelan government’s arrests and seizures led to the disruption of two major drug trafficking operations: the Hasbun and Luis Alberto Ibarra cartels. The Hasbun group was responsible for multi-ton cocaine shipments to the U.S. via Venezuela and Mexico. Under the leadership of the Venezuelan Prosecutors Drug Task Force (PDTF), twenty-four traffickers were captured and seven of the group were killed in the course of numerous raids which led to the confiscation of about six metric tons of cocaine. The Luis Alberto Ibarra cartel was also subjected to heavy pressure from Venezuelan authorities. According to the INCSR, the PDTF coordinated an investigation that involved the collection of evidence, obtainment of controlled delivery orders, overall surveillance, and arrests of members of the organization who provided testimony against Ibarra. The investigations ultimately led to his arrest and extradition, with a U.S. court eventually sentencing him to 21 years in a U.S. prison. A State Department report notes that David Kelley, U.S. Southern District judge of New York “…praised the cooperation between several U.S. enforcement agencies and Venezuelan judicial police in investigating the case.” The report notes the additional arrests of 17 members of Ibarra’s criminal organization, underlining Venezuela’s achievements in the war against organized crime. Moreover, the Venezuelan government recently implemented legislation that will aidin the fight against drug trafficking and domestic drug consumption. In 2005, Venezuela passed the Organic Law Against Illicit Traffic and Consumption of Drugs and Psychotropic Substances, as well as the Organic Law Against Organized Crime. These laws stipulated that those who traffic and harbor drugs and illegal chemical substances will be subject to six to eight years in prison. The punishment will be increased if the offender is a government official, a member of the National Guard, a judicial authority, or anyone who impersonates such individuals. In addition, Venezuela’s National Commission Against the Illegal Use of Drugs (CONACUID) was renamed to the National Anti-Drug Office (ONA) and given financial, administrative, and functional autonomy as a co-participant in the effort. Whether these laws will be consistently applied remains an open question. Nonetheless, the legal foundation now exists to aid authorities in their fight against drug trafficking. Prospects of corruption — much of it inherited by Chávez — clearly poses a test for Venezuela’s crackdown on the drug flow. Personnel at the Maiquetia International Airport are reported to have witnessed numerous incidences of corruption amongst employees. The Miami Herald states that up to an estimated $2 million in bribes are paid monthly by drug traffickers to airport officials, as well as some members of the National Guard and the police. Other techniques, such as using passengers or couriers to transport drug cargo, are also employed by the cartels. Venezuelan authorities will need to pay closer attention to such activities and introduce new measures in order to effectively end these practices. Even so, there have been convincing steps taken by Venezuela against corruption. Earlier this year, 60 anti-drug officers were fired after charges of mishandling or losing confiscated drug supplies. Luis Correa, head of ONA, reported that “they ordered a complete cleanup of the CICP anti-drug squad; that means the removal from the director to the last officer,” indicating that Venezuelan officials are highly motivated to target long-practiced corrupt procedures in law enforcement. The Venezuelan government has clearly undertaken comprehensive steps to combat drug trafficking through domestic operations as well as multilateral efforts. These moves must be maintained and improved upon in order to continue interrupting drug flows primarily originating from Colombia. Simply putting the blame on Venezuela’s inherited weak and often venal judicial system will not suffice. Chávez has moved aggressively to deal with the narcotics problem, and even official U.S. statistics indicate this. The claim that Venezuela is any less cooperative or vigilant in its anti-drug efforts than other area nations which were not decertified is nothing more than a tendentious invention. The long list of investigations, arrests and legislation which have been undertaken by the Chávez government are not suggestive of a country that is failing “to meet international treaty obligations.” The incontrovertible conclusion is that without any justification, Washington deliberately discredits Venezuela’s anti-drug efforts, defaming a nation whose major pecado is not its laxity in the war on drugs, but rather its willingness to defy the will of Uncle Sam on repeated occasions over the issue of not so much drugs or terrorism or human trafficking, but of sovereignty.